Banff is one of Canada’s most popular tourist towns, but it is also an ice and rock climbing hub. In the winter, people from around the world use Banff, located in Banff National Park in the Bow Valley, as a base between ice climbing days in the Rockies. In the summer, climbers come from all over for the great sport and alpine climbing in the Alberta mountains. The Bow Valley extends from the eastern edge of the Rockies near Yamnuska to Lake Louise and has dozens of fun multi-pitch routes and steep sport climbing test pieces. Banff is where the Spray and Minnewanka valleys meet the Bow. The result is a number of rock formations close to valley bottom with solid stone. Establishing these routes can take dozens of trips and hundreds of dollars in hardware. The following are five multi-pitch routes close to Banff that have short approaches, protection bolts and rappel anchors. Be sure to wear a helmet in the Rockies as the rock is unpredictable. 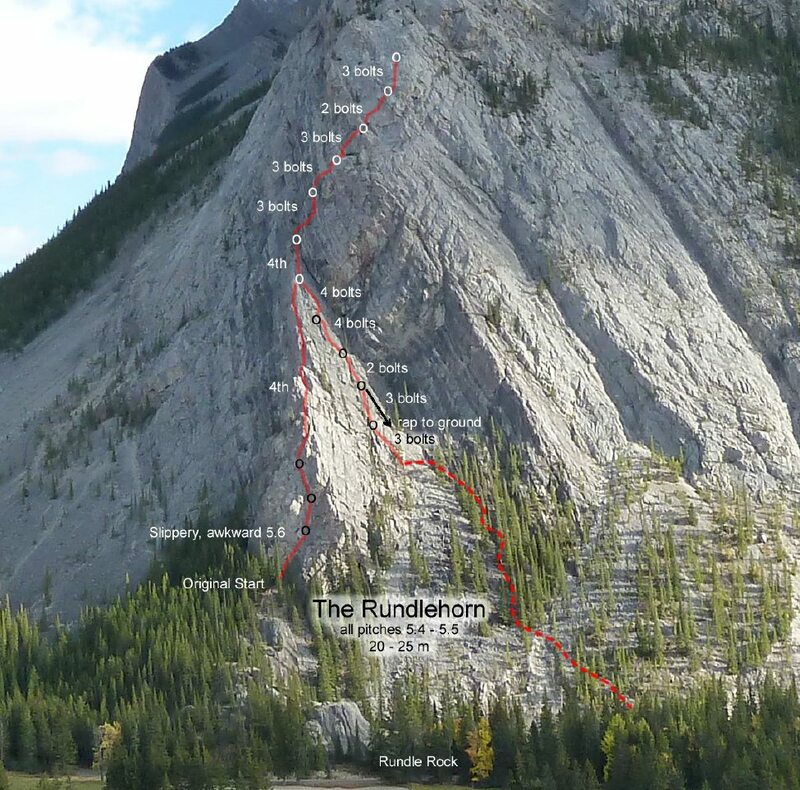 Rundlehorn is an 11-pitch 5.5 retrofitted line on Mount Rundle. It is often used as an intro to multi-pitching by local guides. It climbs the long west ridge and starts above a short scramble up a slope. The first few pitches climb a slab with spaced bolts and featured rock. You pass trees and ledges with loose rock. You then turn a corner and head up the north side of the ridge and the crux pitch. Easier pitches ramble up after that. Don’t attempt to hike off as the forest cliffs out. If you have a 70-metre rope, you can link raps down the route, otherwise it takes about 10 rappels. For approach and pitch info see here. The Shoe is a three-pitch 5.8 near Gonda Roof on Tunnel Mountain. Once an unpopular old traditional route that was difficult to protect, it was retro-fitted a few years ago with a direct start and is now fully bolted. The bolts replaced old and rusty pitons on the established pitches. The first pitch climbs down-slopping holds to a right-trending crack. The second pitch is the crux as you have to stem up a steep corner and negotiate a small roof. The third pitch has an old shoe hanging from a fixed piton. From the top, you can walk back to the road in a few minutes. For more info see here. Plutonian Shores is a seven-pitch sport route at Raven Crag, which was once a go-to wall for hard bolted routes. Located on Sulfur Mountain overlooking Vermillion Lakes, the area takes about an hour to get to and is cool until mid-summer. The upper wall has old Peter Arbic 5.12s and more modern 5.13s. Plutonian Shores was established in 2012 and while some of the pitches have loose rock, overall it is a high-quality 5.9. The final crux pitch goes up a steep wall with fun pockets and tricky moves. has become one of the Rockies’ most-climbed mutli-pitch sport routes. The nine-pitch 5.7 goes up solid limestone at the well-known Guide’s Rock on Mount Cory above Hwy 1A between Banff and Lake Louise. The stone is textured with stipple and water runnels that offer big holds. Pitch three and seven have short cruxes with easy-to-read climbing. Where the bolts are spaced, the climbing is easy. It is listed as nine pitches, but you can link a number of them together. The route is named after the marshy area between Mount Cory and the Trans Canada, which was once called Aftonroe, but is now referred to as Backswamp. Jon Whyte was a Banff local who tried to have the name Backswamp changed back in the 1980s, and the route is named in his memory. For approach and pitch info see here. On the western edge of Buffalo Crag on Cascade Mountain is a seven-pitch 5.7 that follows mellow slabs and rambling terrain to the upper forest. The approach only takes about 30 minutes and you can rappel the route. It’s a great option for early season, as it gets the sun all day. For more info see here. 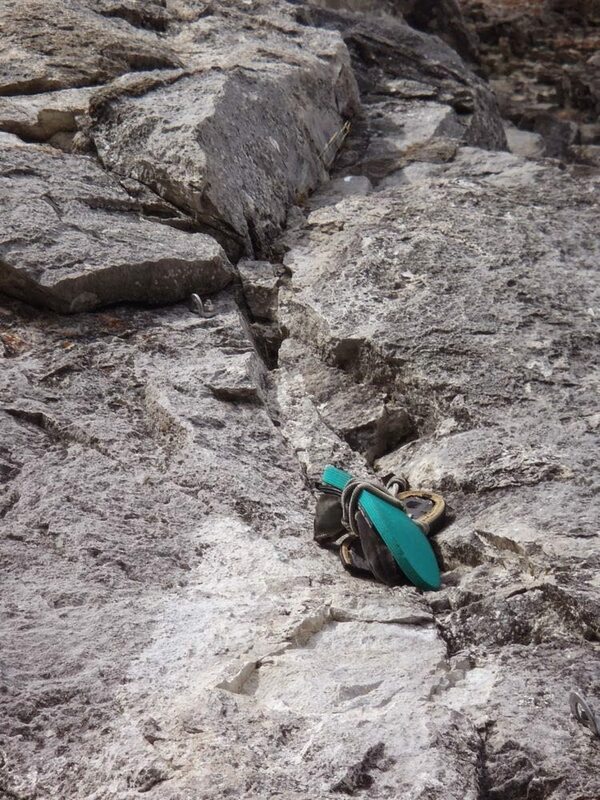 While all of the above routes are sport routes, in that you only need to bring quickdraws and slings for protection, many of them have spaced bolts and loose rock. Some climbers bring gear for the placements between bolts. You can never be too safe on big routes in the Rockies so familiarize yourself with Parks Canada’s rescue services and numbers here. For four fun alpine routes in Kananaskis see here. The shoe is gone from Le Soulier. I climbed the route a couple weeks ago and was heartbroken to find the old piton with no shoe tied to it!